Highly would recommend this Duvet for the price. Material is fairly decent and the ease of the zipper on the end makes it easy to put on and take off. 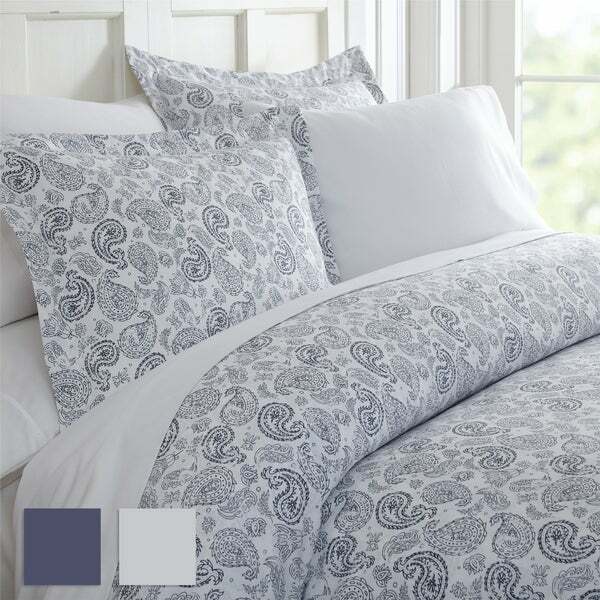 Enjoy the ultimate comfort and elegance with the Coarse Paisley 3-Piece Duvet Cover Set by Merit Linens Both the Duvet Cover and the matching Shams are crafted with the finest microfiber that's softness is unsurpassed. In addition, this quality set is durable, fade resistant, and wrinkle free. The 3-Piece Duvet Cover Set comes in 2 gorgeous colors guaranteed to match any style. This is a great inexpensive duvet cover. The set came with two pillow shams and the duvet cover. Easy to inset my duvet into and beautiful coloring. Overall this Duvet set is super nice, but if you are a perfectionist you will dislike the pattern print ending in some spots as if it were folded or wrinkled when printed, it would be considered a "Second" in some retail stores. But my experience overall is good since I am not OCD inclined. This set stays surprisingly clean considering I have 4 cats, and it is mainly white with a navy blue paisley pattern. This set is machine washable too, assuring easy maintenance! It is soft and comfortable and has the wonderful option to secure the Duvet to my comforter with button loops inside the corners to reduce slippage of the comforter inside. I am very pleased with it and have come to accept the printing errors as just a "unique" part of the pattern! PS. The matching shams will hold nice thick standard pillows just right! The pictures do not do it justice. It is a beautiful print. I love paisley, it is my favorite print. It is soft to the touch. It will lay nicely on the bed. I got this for an unbelievable price. Overall, the value is there for the cover and the two cases. Colors went great in the bedroom, but it's huge for a full size bed. I should have measured the bed first. These duvets are practical for both a boy or girls room. The ciolor (we bought blue) blends softly with most decors. Easily handled in the wash. Price was excellent. I bought 2. One of the best purchases I've made! I ordered the king size, it was a little hard to get my comforter in there at first just from it being so large, but once I got it going it was easy. Soft fabric and doesn't look like a duvet cover at all! Highly recommend. I am happy that the print is far more distinct than the picture. It looks great in my navy and white room. The extra long twin size more than covers the mattress. It came in a small tube bag which I intend to fill and use as another interesting pillow! I was very impressed with the quality of this duvet cover. I can't believe how soft it is for the price! I really love this duvet cover and pillow shams. They are so soft and snuggly. It’s ample dimensions ensure my comforter isn’t bunched up inside. There are corner ties to secure the placement of my comforter. I love the simple design. It doesn’t over power the room and goes with everything. So happy with this purchase and the experience with Overstock. The price was really great as well. i finally received the duvet set. I would not buy again. The fabric is OK, but the print on the cover is missing in several places. This repeats throughout the duvet. It is consistent on both sides. I will not used it. If I can return the item, I will. otherwise I will donate it. This is beautiful, the pictures do it no justice. It is a thicker type of cotton. Very not nice. Would recommend. Have not used yet, did take out of the bag it came in to check it out. I liked how soft this duvet is. It washes beautifully and can double as a bedspread quite easily! I love the pattern and it is so soft and comfy! I can't believe how nice it is for the price. Just returned color did not match. Very soft! I put a white dust ruffle around the bottom, looks great together. I was pleasantly surprised at the quality of the material.The description was microfiber so I was expecting a "brushed/sude" feel but this was more like cotton/silk. Very nice, extremely soft.It said do not iron so I washed it and put it in the dryer on permanent press to get the wrinkles out and it came out beautiful.The only reason for the 4 stars instead of 5 is, as other have stated, the pattern cuts off places but I guess that is what "course paisley print" means.I got the blue which is a very nice bright blue. I am very pleased with this purchase! I highly recommend this set, the fabric pattern is beautiful and so soft!! Shipping was extremely quick also! You wont be disappointed if you purchase this set!! "Does this duvet cover have ties inside to keep the comforter in place?" I like the pattern, and the price was right. Hopefully it works out. "How thick is the duvet cover"
It is 2 microsheets sewn together. I does keep you warm. Feels soft, and washes well.